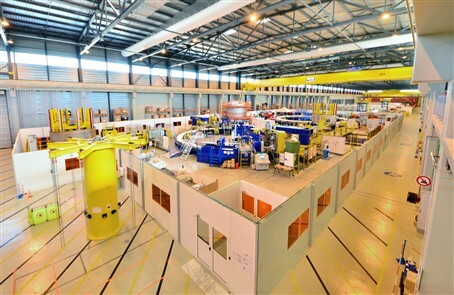 ITER Poloidal Field coils facility, part of Europe’s contribution to ITER, managed by F4E and operated by its suppliers, Cadarache. Two stations with winding tooling are in opeeration. The drilling and building on the ITER site naturally catch our attention because all the activities are unfolding outdoors. The aerial shots offer us a spectacular view of the progress. There is however another aspect to the ITER site, one linked to tooling and manufacturing. Four of the five massive Poloidal Field (PF) coils, which Europe needs to deliver, are produced in a huge workshop which is also located on-site. F4E and its contractors have set up a facility to produce the large magnetic coils that will control the shape and stability of the super-hot plasma. More than 70 people are daily working in this factory and they are focused on meeting the tight production schedule. Technicians checking the equipment to be used for the impregnation of the Poloidal Field coils. The ITER Poloidal Field coils facility is part of Europe’s contribution to ITER, managed by F4E and operated by its suppliers, Cadarache. Precision is key to the success of this operation. The first step, which consists of winding the lengthy pieces of conductor with milimetric accuracy, is crucial. So far 42% of PF 5 (ITER’s fifth poloidal field coil) has been completed with six out of the eight double pancakes (pairs of conductor lengths) needed wound. The manufacturing of these gigantic rings is in progress. Five of these coils have been terminated, where electrical tests have been successfully performed, and three of them have been impregnated (an additional one will be completed in October), making them resistant to the extreme forces inside the ITER machine. A mockup of a winding pack, consisting of multiple layers of impregnated conductor lengths, has been assembled. Through this process technicians can identify any production glitches before real manufacturing kicks in at this level. The next stage is to commission the cryostat and the cryoplant. Prior to being assembled, the ITER magnets will undergo various tests to check their thermal insulation at temperatures as low as -183 ˚C (90 K). The diameter of the magnets will range from 17 to 25 m and their weight will range between 200 and 400 t. Therefore, cryostats of different sizes have been developed to house the magnets and to perform the tests. The first cryostat assembled at the ITER Poloidal Field coils facility, provided by Criotec. The ITER Poloidal Field coils facility is part of Europe’s contribution to ITER, managed by F4E and operated by its suppliers, Cadarache. Technician from CNIM, F4E’s supplier, working on the terminations as part of the Poloidal Field coils manufacturing. The ITER Poloidal Field coils facility is part of Europe’s contribution to ITER, managed by F4E and operated by its suppliers, Cadarache. “The work completed so far has shown the importance of matching people with the processes they need to perform. Imagine setting up a factory from scratch. It is not just a matter of assembling the tooling. It is also a matter of building a team of people with the right skills and planning their activities. We experienced some challenges with the helium inlet welding qualification and in order to mitigate the risk for the future, we decided to use the same automatic welding machine that ASIPP (The Institute of Plasma Physics of the Chinese Academy of Sciences), had developed for the sixth PF coil. This is now being introduced and it will pay off in delivery”, Kevin Smith, PF coils Manager for F4E, explains. View of the ITER Poloidal Field coils facility with one of the cryostats and the impregnation station behind. The ITER Poloidal Field coils facility is part of Europe’s contribution to ITER, managed by F4E and operated by its suppliers, Cadarache.